The St Petersburg Ballet Theatre (SPBT) has quickly established itself as one of Russia’s leading classical ballet companies. It was founded in 1994 by Konstantin Tachkin who has continued to direct the company over its 24-year history. 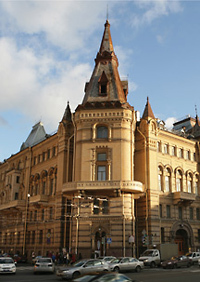 SPBT is housed in a magnificent studio complex on Liteiniy Prospekt, situated in the heart of St Petersburg, which in Imperial Russia had served as the House of Officers. This ensemble of sixty dancers is the only major classical ballet company in the world that exists and thrives without reliance on state subsidy or private sponsorship. To be independent of government funding or any major sponsor is a remarkable and unique achievement in the modern age. Although the company performs frequently in its home city and throughout Russia it also has an enviable reputation for its international touring, giving up to 250 performances each and every year. SPBT tours have ranged over six continents, travelling to Spain, Germany, Belgium, The Netherlands, Great Britain, Ireland, France, Italy, Austria, Finland, the USA, Brazil, Turkey, Israel, South Africa, South Korea, Singapore, Australia, New Zealand, Japan, China, Macau and Taiwan. The Company has a repertoire that includes all the masterpieces of classical ballet: Giselle, Don Quixote, La Bayadère, Les Sylphides, Paquita; Romeo and Juliette and, of course, the Tchaikovsky classics from St Petersburg - Swan Lake, The Nutcracker and The Sleeping Beauty. The company’s sixty professional ballet artists are all either graduates of the world famous Vaganova Ballet Academy in St Petersburg or from one of several other significant Russian ballet schools. Famous dancers of the past now work as ballet masters and mistresses, coaching the company’s principals, soloists and corps de ballet: People’s Artist of Russia, Lyubov Kunakova; Merited Artist of Russia, Yuri Gumba; and Margarita Kullik are just three of these renowned former star dancers now passing on their knowledge and expertise to today’s performers, SPBT is proud to have created many home-grown stars of its own over the past two decades. Among the principals, soloists and character dancers who have come to maturity within the company are artists such as Margarita Avdeeva, Dmitriy Akulinin, Mykhailo Tkachuk, Maria Tikhonova, Seiyu Ogasawara and others. They represent the kernel of the company’s creative achievement as well as the continuing guarantee of its ongoing success. The sparkling jewel in the company’s crown is Irina Kolesnikova whose name alone sells out theatres throughout the world with unvarying regularity. Devotees of ballet, not to mention demanding dance critics, continue to marvel at her outstanding talent. Kolesnikova is flambouyant. She is delicate. She is a true Prima Ballerina Assoluta, the very pinnacle of balletic artistry. SPBT remains the centre of attention for the world’s press, performing as it does in such celebrated theatres as the London Coliseum, the Royal Albert Hall, the Théâtre des Champs Elysées in Paris, the Bunkamura Hall in Tokyo, the National Theatre of Taipei, the National Theatre in Beijing and The Princess Theatre in Melbourne.